For this first session we settled on some work on your breathing, to address a sense of discomfort with breathing after just a length or two. I observed you swimming a few lengths and did not see something in your shape and stroke patterns which would make me think your problem for breathing is there. All the key supporting features are in place. So, this led me to suspect that the problem is in Air Management. At this leisure speed and tempo, a 2-stroke breathing pattern is normally excessive. So, we want to reduce the average number of breathing, without putting too big of a gap between breaths, or making those gaps not so frequent. We want an abundant air exchange opportunities, so we can afford to skip one from time to time, while keeping the number of breaths minimal. The first tweak we could experiment with is to adjust your 2-stroke breathing pattern to 2-4-2-4, while keeping on your stroke (right) breathing side. Then swim 2 lengths and see how you feel on that second length. Then let’s compare that 2-4-2-4 pattern to a 3-stroke pattern. Swim 2 lengths. The next assignment was to work on the exhale technique and see if that brings more ease. Then I showed you how we can put all those air management ideas into a choreography that spans across the three stroke breathing pattern. After refilling lungs, hold air briefly, then begin a soft exhale of bubbles from the nose on that first non-breathing stroke. Then gradually increase the rate of exhale on the second stroke. Then make a last squeeze of the diaphragm to blast air out of the nose and mouth, clearing the airways just as those openings break the surface – just like dolphins do when they are breaking the surface to breathe. I gave you permission to set aside all other concerns for technique and stay focused on assigned focal point for breathing during this practice set. Add 3 strokes breathing pattern to about 50% of your practice time, if that is not too stressful. Add 50s to your practices. Apply your focal points to the challenge of the second length, since you are empowered with these focal points to reduce the sense of breathlessness. You may find that while concentrating on regulating your exhale, you can keep the level of breathing stress low enough that you could continue on for many more lengths. At first, you took some video of me doing a dry land recovery swing drill. Laying down, prone, swinging the arm while dragging the back of the hand along the carpet. Standing with back to wall, swinging the arm upward without touching the wall with my elbow. All of these activities held Skate Position as the priority, because that is the position which receives the waves of force from the rest of the body and transmits those into forward motion. The emphasis is on sliding the body forward on each stroke, rather than pushing water back. So imagine Skating on ice, sliding on one skate for a moment, and then switching to slide on the other skate. Imagine this as you are ‘Skating’ in the water, switching from Skate to Skate. You may like to review this Intro to the Catch and Hold. I suggested that you may use a snorkel for some of your swimming to allow more continuous repetitions, more build up of fitness, while you are still working on breathing as a separate project. (You may read Guidance On Using A Snorkel). 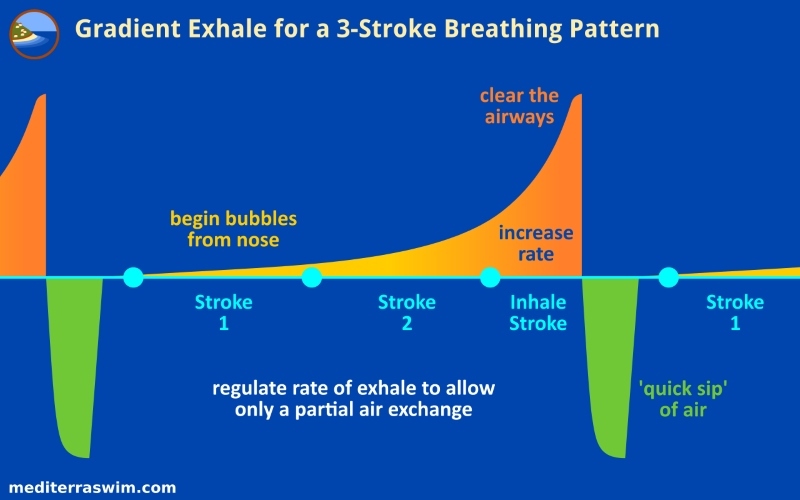 Then spend other part of your practice with 3-stroke breathing pattern to add that complexity. And I recommended that you insert a test swim once a week where you simply set the intention to swim a single length as comfortably as possible, in ‘walk’ mode, (especially with your breathing focal points), and then if all is feeling OK (not near the red line of breathlessness or stress) then turn and do another length, and so on. Keep your attention in that length, in each stroke moment, making it your best, not thinking ahead to the next length. You may be surprised at how many lengths you can end up doing if you remove pressure to perform, and stay in the moment of each stroke, applying certain focal points, doing your best to stay relaxed in the movement pattern. Glad you have a tempo trainer now. It will be a fun tool. Make gradual adjustments in tempo. It takes time and a process for your nervous system to adapt to faster choreography. It’s not so much a strength issue as a neural one. You may look at one of the recent blog posts here on the Dojo where it lists several articles on how to work with tempo. Some of that might catch your eye and guide you in how to use it more effectively at this stage. And, you can always find a pet rock to hold in your hand if you can’t find a rubber donut!